ADVANTIX SPOT-ON SOLUTION is an ectoparasiticide that contains imidacloprid and permethrin.This combination acts as an insecticide, acaricide and as a repellent. 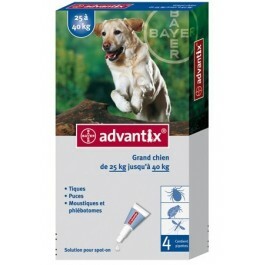 ADVANTIX SPOT-ON SOLUTION can be used for the prevention and treatment of fleas. It can also be used as part of a treatment strategy for Flea Allergy Dermatitis (FAD), where this has been previously diagnosed by a veterinary surgeon. ADVANTIX is effective against all developing flea life stages in the immediate environment of the pet. Therefore, it breaks the flea life cycle to keep pets, plus the households they live in, free of fleas. ADVANTIX kills and repels ticks, and repels sand flies, mosquitoes and stable flies. ADVANTIX is only available with a prescription from your veterinary surgeon. ADVANTIX contains Imidacloprid and Permethrin. Imidacloprid is an ectoparasiticide belonging to the chloronicotinyl group of compounds. Chemically, it can be classified as a chloronicotinyl nitroguanidine. Imidacloprid is effective against adult fleas and larval flea stages. In addition to the adulticide flea efficacy of imidacloprid, a larvicidal flea efficacy in the surroundings of the treated pet has been demonstrated. Larval stages in the dog's immediate surroundings are killed following contact with a treated animal. It has a high affinity for the nicotinergic acetylcholine receptors in the post-synaptic region of the central nervous system (CNS) in insects. The ensuing inhibition of cholinergic transmission in insects results in paralysis and death of the parasite. Permethrin belongs to the type I class of pyrethroid acaricides and insecticides and also acts as repellent. Pyrethroids affect the voltage-gated sodium channels in vertebrates and non-vertebrates. Pyrethroids are so called “open channel blockers” affecting the sodium channel by slowing both the activation and the inactivation properties thus leading to hyperexcitability and death of the parasite. In the combination of both substances, it has been shown imidacloprid functions as the activator of arthropod ganglia and therefore increases the efficacy of permethrin. The product provides repellent (anti-feeding) activity against ticks, sand flies and mosquitoes, preventing the repelled parasites from taking a blood meal and thus reducing the risk of disease transmission (e.g. borreliosis, rickettsiosis, ehrlichiosis, leishmaniasis). However, there may be an attachment of single ticks or bites by single sand flies or mosquitoes. For this reason, a transmission of infectious diseases by these parasites cannot be completely excluded if conditions are unfavourable. The product provides repellent (anti-feeding) activity against stable flies thereby assisting in the prevention of fly-bite dermatitis.The product is indicated for dermal administration. Following topical application in dogs, the solution rapidly distributes over the body surface of the animal. Both active substances remain detectable on the skin and hair of the treated animal for 4 weeks. Acute dermal studies in the rat and target animal, overdose and serum kinetic studies have established that systemic absorption of both active substances after application on intact skin is low, transient and not relevant for the clinical efficacy. 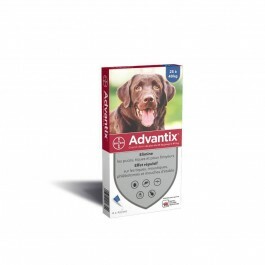 >ADVANTIX SPOT-ON SOLUTION is a prescription product and must be applied according to the instructions by your veterinary surgeon. Please read the product leaflet thoroughly before applying to your pet.